Outer coat is straight, coarse, dense, medium length, lying flat. Undercoat must be present on neck and thighs. 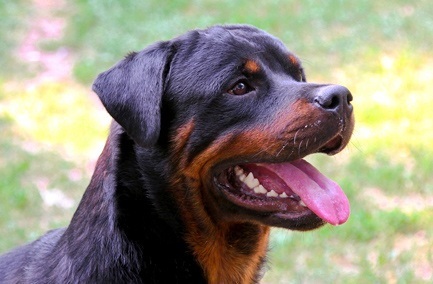 The Rottweiler should be exhibited in a natural condition without trimming, except to remove whiskers, if desired. The colour is always black with rich tan to mahogany markings. Rotties have an intense guarding instinct that should not be underestimated. Only experienced dog owners should own Rottweilers as their tolerance to children and strangers is variable. They have a herding technique called “bumping” which can be hazardous around the elderly or infirm. Hip and elbow dysplasia are common in this breed.